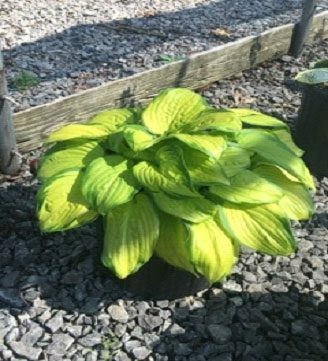 The Stained Glass hosta was named “Hosta of the Year” in 2006 and it’s easy to see why. This plant produces beautiful yellow leaves with green edges and veins. This color combination is the reason for its name. Blooms are large and do produce some fragrance. Their lavender color provides a beautiful contrast to the foliage itself. Stained Glass grows best in full shade. Consider planting it near the woods for maximum protection and to add a pop of color to these darker areas. This variety works well as a ground cover and will help you manage erosion. It also makes a fine addition to any border or cutting garden and can grow successfully in containers, too. Regardless of where you plant it, make sure it’s watered regularly. Weekly watering should suffice, although more frequent watering is recommended in hot weather.